As Charter Schools Become Divisive, Two Parents Give Their Take The number of charter schools that are suing the Baltimore City Public Schools is increasing and some parents need to make a choice between two big options: district vs. charter. 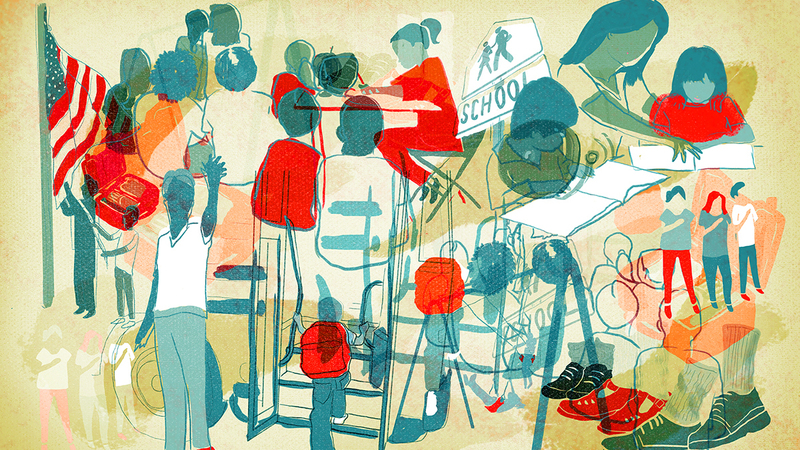 Charters are publicly funded and privately run; they're a place for educational innovation. But with lawsuits underway in 45 states, they're also the subject of resentment from public school workers and parents who say they're siphoning resources. The whole thing underscores the difficult decisions parents have to make. In Baltimore, where more than a dozen charter schools are suing the city over funding, we hear from two parents facing two different choices. This week on For the Record: the personal choices in public education. Click the audio link on this page to hear the full story. Before sending her children to Southwest Baltimore Charter School, Marita King enrolled her son in the local public school. He started out above grade level in kindergarten, but by first grade things got tough. Classrooms were overrun, and a new, less experienced teacher meant her shy son, wasn't getting much attention. Although she says she was a constant advocate for her son, he failed to move up after the state assessment test. "I was determined that he would not be repeating the first grade in that school," she says. That's when her son scored a spot in the lottery at Southwest Baltimore Charter School. "The second day of school, I pull up to drop them off in front of the school building, and they both have groups of friends waiting for them to get out the car," she says. "None of the other schools have anyone to embrace them that way." Ben Dalby went the public school route with his first and fourth grader after frustrations with the charter schools' limited availability. When he was shopping around for his kids at the local charter school, he was pleasantly surprised. The space was beautiful, the principal was committed, but the fight to get in made him uncomfortable. With 200 applicants shooting for about a dozen available slots, he says, "It made me angry, truthfully, that quality education was going to be made available to such a tiny number of people in the city." So he and his wife decided to send their kids to the neighborhood public school, Hamilton Elementary Middle School. And while they're really happy there, Dalby thinks that charter schools can often better offer what kids need because they have more money. That's where it gets muddy. Charters and traditional public schools both get federal funding. In Baltimore, the argument is over how that money gets distributed. Before she was introduced to Southwest Baltimore, Marita King thought all charter schools were private schools. "Charter schools do not get nearly half the amount that public schools get," she says. "Our charter school we go out and we find ways to raise money for our school that goes along with the small amount we get from the government." Ben Dalby says, sure, some charters are providing a great education, but it would be better if all those resources and all the involved parents just stayed in their local public schools and improved them for all students. Instead, he says charters are siphoning money and energy. "They have become viewed as a life boat. Or an escape hatch for the small population of families that are able to get into them, and I don't think that's helping the system as a whole," he says. Both parents are taking it grade by grade. Dalby is all-in with public schools, for now, and King hasn't ruled out the possibility that her son might go to a public high school. But for now, he's thriving. "He went from not being on grade level, to being on grade level and surpassing grade level," she says. "He's no longer that quiet child in class, he'll raise his hand and ask for help."